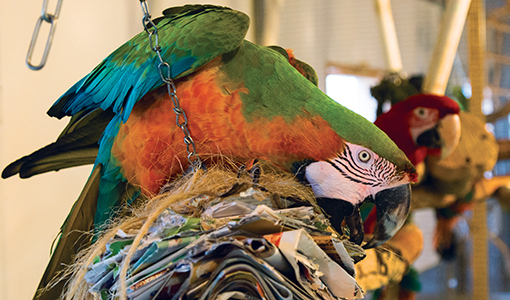 On the site of a former egg and meat production farm, a nonprofit rescue and adoption service for mistreated and unwanted pet parrots has created something extraordinary. The New England Exotic Wildlife Sanctuary provides a safe, permanent home for more than 400 birds. Within the 25,000- square-foot facility in Hope Valley, Rhode Island, more than 60 spacious indoor and outdoor aviaries promote natural bird behaviors, such as flight, foraging, play and social bonding. The sanctuary is a service of Foster Parrots and also offers educational and student internship programs and an adoption center. Cummings Veterinary Medicine toured the sanctuary with its director, Danika Oriol-Morway, who received a master’s degree in animals and public policy from Cummings School. Why did these parrots end up here? Many birds outlive their caretakers. Green-winged macaws have a lifespan of 80 to 100 years. Amazon parrots live 60 to 80 years. Even smaller birds, like African grey parrots, live to around 60. If I were to adopt a young macaw right now, it would probably outlive me, and I’m only 30. Although it’s hard to know how many pet parrots are in the U.S., experts put their numbers at anywhere from about 8 million to 20 million birds. On average, we get requests to take in one or two birds a day. We have a lot of birds here that self-mutilate by plucking out all their feathers or in some cases do serious injury to themselves, which rarely happens in the wild. There isn’t a clear understanding of what causes them to self-mutilate. Many consider it a compulsive behavior that is often linked to stress, a lack of stimulation or a lifetime of neglect—some of our birds had never been out of a cage larger than a square foot. How does the sanctuary care for parrots? But we often have to take it day by day and bit by bit. We have some parrots that only want to interact with other birds, parrots that just want to be with people and will never form natural relationships with other birds, and some parrots that are completely phobic about open spaces because they’ve spent their entire lives in a cage. We pay a lot of attention to enrichment activities. Getting outside provides the best, most dynamic environment. Parrots love the rain; it encourages them to preen. Bert, our enormous hyacinth macaw, went out in a huge storm the other day and got completely soaked. When he came back in, he fluffed himself up and walked around with his wings spread out until he was dry. We have seven staff members and about 30 volunteers, all of whom spend the bulk of their time directly caring for the animals. All our parrots enjoy a fresh, handmade salad every day, with ingredients like beets, kale, celery, apples, carrots, summer squash, beans, pasta and grapes. They also receive a medley of seeds and nuts, both in and out of the shell. Right now we wash all their dishes by hand—that’s about 1,000 dishes a day. Thankfully, someone donated a commercial dishwasher that will be installed soon. We are creating new aviaries, too, and a large geriatric ward. We have a group of senior animals, and some have balance problems, others vision problems. We are working on setting them up with a special aviary that has low perches and perches on the ground, as well as other environmental modifications suited to these animals’ particular physical limitations. Why do people want to keep wild animals like parrots as pets? Parrots are in this very bizarre place. They’re considered companion animals, categorized right next to cats and dogs. But they’re wild animals. So they serve as a great platform for initiating conversations with people about our relationships with wild animals. What do we get out of such relationships? What are the animals’ needs, and are they being met? It gave me a new perspective on sanctuary work. Our job is to offer the birds something as close as possible to that life in the rainforest. We’ll never really come close, but I hold what I got to see in Costa Rica in the back of my mind to push me to give our birds more freedom, more nest space, real relationships. We recently got Magoo, a cockatoo that was among nine birds rescued from a terrible Texas breeding ranch in 2010. We suspect Magoo was kept in a small box for most of his life. He had advanced cataracts in both eyes and was completely defenseless because he was blind. Through the collective effort of our veterinarian and supporters, we were able to get one cataract corrected. But despite gaining vision in one eye, Magoo was still incredibly phobic and spent most of his time inside a box in a cage. We kept his box in that cage for a while, and then moved that cage into an aviary. We finally took the box out of the cage and set it directly in the aviary. All of us were holding our breath. Was he going to freak out? This morning I came in, and Magoo was climbing on a wire up on a treetop. This is a bird that’s never left his box—and now he’s finally acting like a bird, foraging and exploring. That’s why I do this.